" Public memory is short. Few can recall the rampant stray dogs everywhere, young and aged, starving and diseased, scavenging in the garbage, fighting amongst themselves, ignored and abused by the human population, while remaining a menace to all including themselves. In four short years, the roads are more peaceful, with few strays to be seen, and the naturally loving relationship between humans and animals restored to its true state." " It is indeed shocking to see a group of professionals and paramedicals – headed by 73 year old American – taking care of the street animals, free of cost. What dedication.
" I've seen a lot of rescue shelters in my travels throughout Asia. This one sets the standard in every way. But most of all because this one truly understands that "love is the best medicine"." " You and the others at the shelter lived up to your high standards in the rescue of Lakshmi and the care and love given to her in her recovery and life as the shelter's cow. Very beautiful." " I was deeply moved and thoroughly impressed." " I am so amazed at your commitment. Can't thank you enough for doing this work ... I'm too sensitive to pain and suffering to do it myself." "I saw the video. It is truly amazing work that you do. You are all such amazing people. I sobbed through the whole thing. I remember so clearly traveling through India and it really hurt to see animals in the state that they were but I never quite knew what to do. Then fabulous people like yourselves come along and make such a change and shine a light in the world where it is most needed. " " It's amazing what has happened here in Tiruvannamalai in such a short time. It's more than special. It's a miracle".
" Such wonderful work. Obviously transformative on many levels. Heart-warming. The more the word gets out, the better it is for animals and all of humanity." " An animal that's rescued by Arunachala Sanctuary isn't just a patient. Leslie treats them the way people would treat a sick family member. " 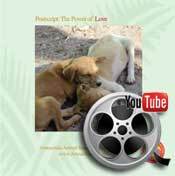 " I was narrating Lakshmi's rescue story to one of my clients who is a doctor (Red Cross) and an animal lover as well. She was totally taken aback, was hard for her to believe that such a place like yours even exists." " I was very inspired by how you are running the sanctuary. I have worked in Calcutta, Kerala and 3 different centres in Goa. I think I mentioned being very disillusioned with the 98% mortality rate of puppies, While you have an 85% survival rate! It has really inspired me to know that places like Arunachala exist."